Mantle cell lymphoma (MCL) is a well-defined aggressive lymphoid neoplasm characterized by proliferation of mature B-lymphocytes that have a remarkable tendency to disseminate. This tumor is considered as one of the most aggressive lymphoid neoplasms with poor responses to conventional chemotherapy and relatively short survival. Since cyclin D1 and cell cycle control appears as a natural target, small-molecule inhibitors of cyclin-dependent kinases (Cdks) and cyclins may play important role in the therapy of this disorder. We explored P276-00, a novel selective potent Cdk4-D1, Cdk1-B and Cdk9-T1 inhibitor discovered by us against MCL and elucidated its potential mechanism of action. The cytotoxic effect of P276-00 in three human MCL cell lines was evaluated in vitro. The effect of P276-00 on the regulation of cell cycle, apoptosis and transcription was assessed, which are implied in the pathogenesis of MCL. Flow cytometry, western blot, immunoflourescence and siRNA studies were performed. The in vivo efficacy and effect on survival of P276-00 was evaluated in a Jeko-1 xenograft model developed in SCID mice. PK/PD analysis of tumors were performed using LC-MS and western blot analysis. P276-00 showed a potent cytotoxic effect against MCL cell lines. Mechanistic studies confirmed down regulation of cell cycle regulatory proteins with apoptosis. P276-00 causes time and dose dependent increase in the sub G1 population as early as from 24 h. Reverse transcription PCR studies provide evidence that P276-00 treatment down regulated transcription of antiapoptotic protein Mcl-1 which is a potential pathogenic protein for MCL. Most importantly, in vivo studies have revealed significant efficacy as a single agent with increased survival period compared to vehicle treated. Further, preliminary combination studies of P276-00 with doxorubicin and bortezomib showed in vitro synergism. Our studies thus provide evidence and rational that P276-00 alone or in combination is a potential therapeutic molecule to improve patients’ outcome in mantle cell lymphoma. Mantle cell lymphoma (MCL), an aggressive B-cell malignancy constitutes about 4-10% of all non-Hodgkin lymphomas (NHLs) population . It exemplifies its clinical onset by a typical gathering of CD20+/CD5+ B cells in lymph nodes, spleen, bone marrow, and blood . Classic (80-90% cases) and blastoid (10-20% cases) are the two powerful variants recognized where the latter is associated with inferior clinical outcome and poor prognosis [1, 3–5]. Although treatment with combination chemotherapeutic regimens can be effective, virtually all patients relapse and the outcome of patients remains poor, with a median survival of only 3-5 years [6, 7]. Currently available therapies including high-dose chemotherapy followed by stem cell transplant, and monoclonal antibody therapy have shown limited success [2, 8]. No therapy has been effective enough to extend the overall survival time of patients with MCL. Thus, it remains incurable with current therapeutics available and awaits more effective treatment approaches . Chromosomal translocation t(11;14)(q13;32) between the IgH and Bcl-1 genes, which results in constitutive overexpression of cyclin D1, represents the hallmark of MCL and seemingly one of the critical oncogenic event, making MCL a genomically highly unstable disease [10–13]. Cyclin D1 coupled with Cdk4 regulates the G1-S transition of the cell cycle and hence this overexpression of cyclin D1 in MCL was thought to contribute to uncontrolled growth. Cyclin D1 overexpression contributes to the lymphomagenesis in MCL by overcoming the suppressor effect that retinoblastoma protein (RB) performs in the G1/S transition [1, 14]. RB1 seems to be normally expressed in the majority of MCL cases and the protein appears to be hyperphosphorylated , particularly in highly proliferative blastic variants . Enhanced proteolytic degradation of Cdk inhibitors such as p27 and p21 is also observed in MCL . The expression of antiapoptotic members of the Bcl-2 family appears to be one important factor in the acquisition of clinical resistance by MCL cells . From a mechanistic perspective, high levels of expression of the antiapoptotic protein Mcl-1 have been shown to correlate with high-grade morphology and a high proliferative state in MCL [17, 19]. 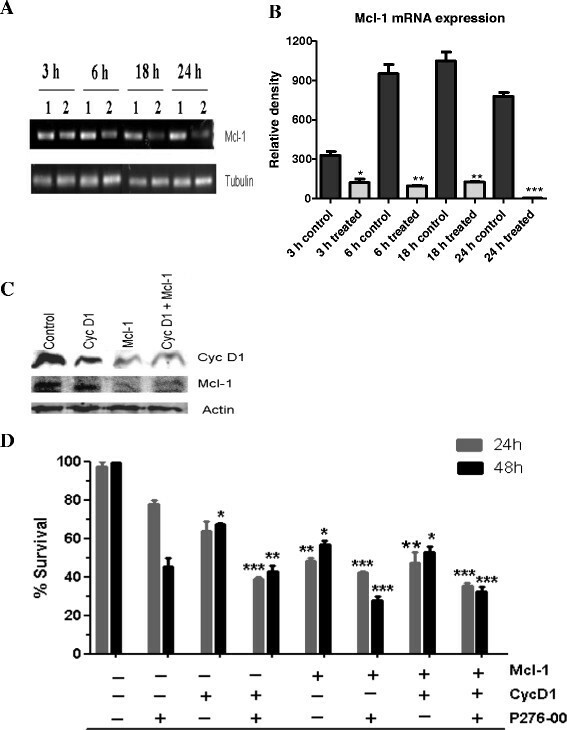 In addition, constitutively active STAT3 contributes to the malignant phenotype of MCL by promoting uncontrolled cell growth and survival through dysregulated protein expression, including that of interleukins viz; IL-6 and IL-10 . P276-00, a novel small molecule inhibitor of cyclin-dependent kinases (Cdks), is currently in Phase II clinical trials. It shows better selectivity towards Cdk9-T1, Cdk4-D1 and Cdk1-B as compared with Cdk7-H and Cdk2-E [20, 21]. Recently, we showed that it inhibits transcription in multiple myeloma cells by inhibiting Cdk9-T1 which plays a positive regulatory role in transcription . In the present study, we have evaluated and efficacy of P276-00 against MCL. Our hypothesis is that P276-00 being a potent Cdk4-D1 inhibitor will induce rapid cell death in MCL cells which overexpress cyclin D1. Also, its ability to down regulate anti-apoptotic protein Mcl-1 would contribute to its cytotoxic activity for MCL cells. Thus, we provide in vitro and in vivo evidence for use of P276-00 as a promising therapeutic agent for the treatment of patients with MCL. All the three MCL cell lines in the presence of increasing concentrations of P276-00 showed significant dose-dependent cytotoxicity as compared to vehicle treated cells (p < 0.0001). 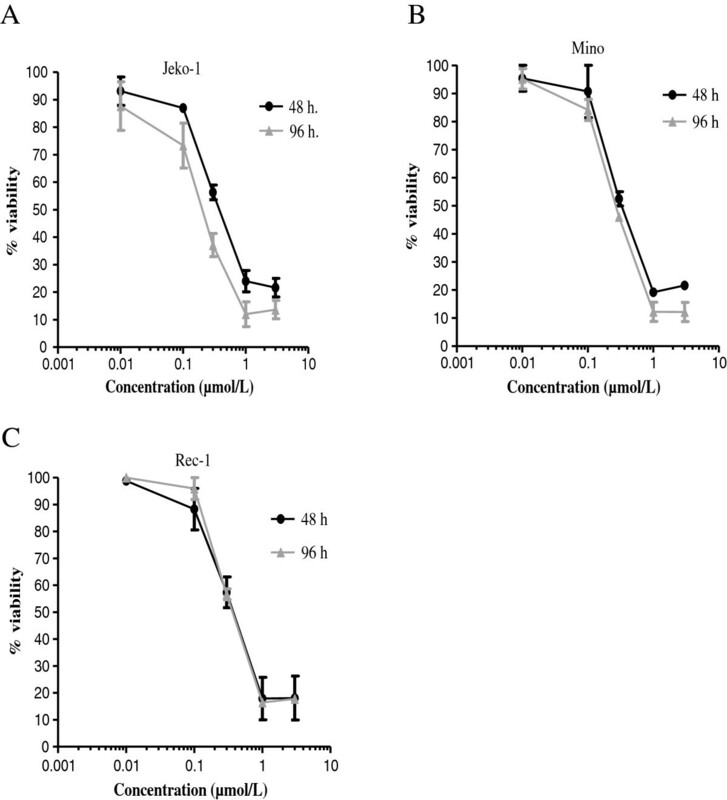 P276-00 resulted in dose and time dependent cytotoxicity with inhibitory concentration of 50% (IC50) ranging from 0.35 μmol/L in Jeko-1 and Mino and 0.5 μmol/L in Rec-1 after 48 h (Figure 1A, B, C, Table 1). Earlier, we have shown that P276-00 is less cytotoxic to resting hPBMCs as compared to conconavalin A (ConA) stimulated hPBMCs [22, 23]. These data indicate that P276-00 selectively induces higher cytotoxicity in proliferating cells viz. MCL cells and stimulated hPBMCs, but lesser in quiescent (unstimulated) hPBMCs. P276-00 mediated cytotoxic effect in MCL cell lines: Dose and time dependent analysis. The effect of P276-00 on viability of MCL cells was determined by CCK8 assay. Mantle cell lymphoma cell lines (A) Jeko-1, (B) Mino, and (C) Rec-1 were cultured in the presence of increasing concentrations of P276-00 (0.01-3 μmol/L) for 48 and 96 h. P276-00 showed IC50 of 0.35 μmol/L at 48 hr and 0.22 μmol/L at 96 hr in Jeko-1 cells. In Mino and Rec-1 the IC50 were 0.5 μmol/L at 48 hr and 0.21-0.33 μmol/L at 96 hr (Table 1). Data presented as the average ± SE of three independent experiments. Jourdan and colleagues  reported that interleukin-6 (IL-6) and insulin-like growth factor-1 (IGF-1) aggravate growth and prevent apoptosis in MCL cells. Treatment of MCL cells with P276-00 overcomes this protective effect of IL-6 and IGF-1 as observed with no change in IC50s in presence of IL-6 and IGF-1 on MCL cell growth (data not shown). Previous studies showed that transcriptional inhibition of anti-apoptotic proteins is a key mechanism for Cdk9 inhibitor-induced cell death in indolent B-cell malignancies . P276-00 being a potent inhibitor of Cdk9-T1, we studied its effect on MCL cells. It significantly inhibited the phosphorylation of RNA Pol II CTD 6 h onwards and continued till 18 and 24 h of treatment (Figure 2A, B, and C). Recently, we have shown similar results in multiple myeloma cells and results were attributed to higher selectivity of P276-00 for Cdk9 than Cdk7, which is responsible for serine 5 phosphorylation of CTD of RNA Pol II [20, 22]. In MCL cells levels of cyclin T1 were also significantly reduced at all the three time points. Owing to inhibition of transcription, rapid down regulation of a short-lived protein Mcl-1 was observed especially in Jeko-1 cells. P276-00 being a potent Cdk inhibitor we studied its effect on cell cycle proteins and kinases. There was significant down regulation of cyclin D1 protein levels and pRbSer780 which was also confirmed by immunofluorescence in Mino after 6 h of treatment (Figure 2D). Cdk4 levels were decreased in Jeko-1 cells after 6 h and after 24 h in Mino and Rec-1 cells. Interestingly p21 and p27 proteins were found to be increased after P276-00 treatment in Jeko-1 and Mino cells respectively at IC50 concentration. Mino cells which harbour wild type p53 showed marked increase in p53 levels (Figure 2B). Increase in the levels of cleaved PARP, a marker for apoptosis was observed in Jeko-1 and Rec-1 cells concomitant with apoptotic cell death. Of all the three cell lines, Rec-1 cell line was found to be the most sensitive. It showed significant down regulation of key proteins such as pRbSer780, cyclin T1 and pRNA pol IISer 2/5 after as early as 6 h of treatment. P276-00 on positive regulators of cell cycle along and anti-apoptotic protein: Western blot analysis of cell cycle proteins at designated time intervals after treatment of (A) Jeko-1, (B) Mino and (C) Rec-1 cells with P276-00. Jeko-1 and Mino cells (1-control, 2- IC50 treated and 3- 3X IC50) were incubated with 0.3 and 1 μmol/L P276-00 followed by protein isolation for Western blotting. Rec-1 cells (1-control and 2- treated) were treated at 1.5 μmol/L (3X IC50) of P276-00 and it showed marked decrease in all cell cycle related protein level in time dependent manner. Marked down regulation of anti apoptotic protein, Mcl-1, were also seen from early time point in all three cell lines. Densitometric analysis of cyclin D1 expression was done using ImageJ software. (D) Regulation of cyclin D1 protein levels and Rb phosphorylation by P276-00 was confirmed by immunofluorescence in Mino after 6 h of treatment. Blue: DAPI (nuclear stain); Green: cyclin D1; Red: pRbSer780. Cell cycle analysis was performed on MCL variant cells after P276-00 treatment. As demonstrated in Figure 3A, B, C and D P276-00 causes induction of apoptosis in asynchronous population of MCL cell lines when exposed to IC50 and 3 times (3X) IC50 concentrations. P276-00 resulted in an increase in sub-G1 cells at as early as 24 h with maximal effect noted at 48 and 96 h (70-80% sub-G1 fraction). P276-00 doesn’t allow cells to enter G1 phase and causes significant shift of cells from G0-G1 phase to sub-G1 phase. To confirm that the loss of Mcl-1 protein was due to decreased in transcription, the levels of Mcl-1 mRNA following P276-00 treatment were measured by reverse-transcription PCR. Tubulin was used as a control. P276-00 caused a rapid reduction of Mcl-1 mRNA in Jeko-1 cell line from 6 h of treatment with the levels further decreasing up to 24 h. It confirmed that the loss of Mcl-1 protein was due to a block in transcription (Figure 4A, B). (A) Mcl-1 mRNA measured by reverse transcription PCR in Jeko-1 cells with (1.5 μmol/L) or without (control) P276-00 treatment at indicated time points (B) Densitometric representation of RT-PCR indicating statistically significant differences compare to control (C) Western blot analysis of protein expression at 48 h after transfection with siRNAs (D) Effect of cyclin D1 and Mcl-1 siRNA in Jeko-1 cells. Cells were transfected with siRNAs i.e. control siRNA (control) and cyclin D1 (cyc D1) or Mcl-1 or the combination of both the siRNAs (cyclin D1 + Mcl-1) with P276-00. Columns, mean percentage of live cells after transfection (treated) from two independent experiments; bars, SD. **, *** significantly different from control siRNA transfected group (** p = < 0.01; *** p = < 0.001). Further we proposed to validate role of cyclin D1 and Mcl-1 in MCL survival using RNA interference (RNAi) approach. siRNAs against Mcl-1 and cyclin D1, which are critical proteins for MCL survival and proliferation, reduced respective protein levels by 60% in Jeko-1 (Figure 4C). There was significant reduction of cell viability at 24 and 48 h with Mcl-1 siRNA and cyclin D1 siRNA at 48 h post transfection. These results highlight the crucial role of Mcl-1 and cyclin D1 in survival of MCL cells. When siRNA treatment was combined with P276-00 significant decrease in percentage survival of cells was observed compared to scrambled siRNA treatment (Figure 4D). Cyclin D1 and Mcl-1 siRNA treated cells in combination with P276-00 showed significant growth reduction at 24 h. At later time point of 48 h, P276-00 with Mcl-1 siRNA showed marked reduction in survival as compared to drug alone (Figure 4D). In vivo P276-00 showed significant tumor growth inhibition of 91% at 50 mg/kg with stable disease throughout the schedule (Figure 5A and B). Kaplan Meier survival curve graph (Figure 5B) showed that mice treated with 50 mg/kg P276-00 (n =10) have a median survival of 68 days (95% confidence interval), which is significantly longer than the median survival of 58 days (95% confidence interval) in control SCID mice. The log-rank test indicated an overall statistically significant difference in survival of P276-00 treated group as compared to vehicle treated group (*p = 0.0366). In PK–PD studies, intratumoral levels of P276-00 reached beyond its effective concentration (Figure 5E) which correlates effectively with significant down regulation of positive regulators of cell cycle (Figure 5C and D). P276-00 in vivo anti-tumor efficacy as single agent and its pharmacokinetics/pharmacodynamic relationship. (A) Treatment with P276-00 in Jeko-1 xenograft by i.p. injection showed significant dose dependent tumor growth inhibition of 91% at 50 mpk with tumor regression on day 8 (***p = 0.0001) and stable disease throughout the schedule (B) P276-00 prolonged survival of tumor bearing SCID mice by two weeks compared to untreated shown using Kaplan Meier survival curve (*p = 0.0366) (C) Protein expression analysis of the tumor samples showed target engagement with marked inhibition of cell cycle regulating and antiapoptotic proteins (D) Densitometric analysis of protein expression in tumor samples showing decrease in levels of proliferation and survival markers (E) High intratumoral levels of P276-00-detection by LC-MS for Jeko-1 tumor samples. We next combined P276-00 with bortezomib and doxorubicin at suboptimal doses. Results indicate that the combination was synergistic as studied by Chou-Talalay method to calculate combination index (CI) . Bortezomib (100 nM) and doxorubicin (1000 nM) with P276-00 showed synergism with CI values ranging from 0.56 to 0.83 (Figure 6A and 6B). Combination studies of standard therapies with P276-00. P276-00 has synergistic anti MCL activity when combined with bortezomib at 100 nM and doxorubicin at 1000 nM. Combination index (CI) was calculated using CompuSyn software. 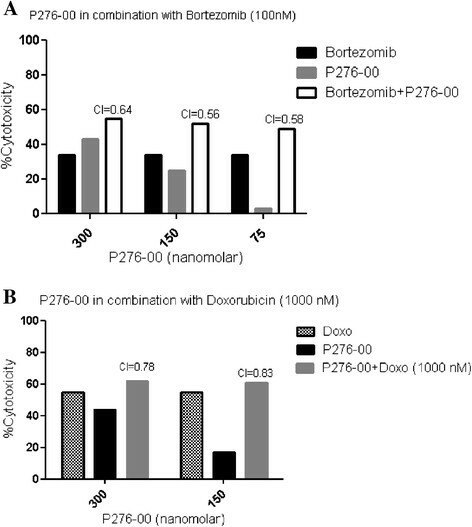 Data for (A) Bortezomib (100 nmol/L) and (B) Doxorubicin (1 μmol/L) are represented, with synergism noted at given concentration of P276-00 and CI of less than 1. Recent advances in the understanding of biology of MCL cells are offering new perspectives for the design of targeted therapeutic strategies. The t(11;14) (q13;q32) translocation occurs in an immature B cell and results in the ectopic and deregulated expression of cyclin D1 and early expansion of tumor B cells in the mantle zone areas of lymphoid follicles. This translocation is considered a primary pathogenesis event that deregulates the cell-cycle control, probably by overcoming the suppressor effect of retinoblastoma 1 (RB1) and cell-cycle inhibitor p27. Since defects in cell cycle regulation and apoptosis are primary events in MCL, small-molecule inhibitors of Cdks may play an important role in the therapy of this disorder. Earlier data from our laboratory has shown that P276-00, a Cdk inhibitor inhibits cyclin D1 and down regulates Cdk4 specific phosphorylation of RB at Ser780 (pRbSer780) along with up regulation of p27 and p21 in breast and lung cancer cell lines [20, 21]. Hence, the present study was designed to evaluate the therapeutic implication of P276-00 in MCL. In this study, we first demonstrated that P276-00 directly inhibited the growth of three MCL cell lines in time and dose dependent manner. It has shown potent cytotoxicity against both nodal and blastic variant MCL cells indicating potential therapeutic implication. Interestingly, our earlier data [20, 22] showed that the same treatment did not affect the growth of normal resting hPBMNCs suggesting a good therapeutic window. Further, this compound was able to induce apoptosis and caused an accumulation of cells in G1-S phase of the cell cycle in all three MCL cell lines. This could be due to significant reduction in cell cycle regulators viz. protein levels of cyclin D1, pRbSer780 and Cdk4 along with down regulation of antiapoptotic protein Mcl-1. Earlier studies have also shown that Cdk inhibitors CYC202 and flavopiridol decrease the levels of cyclin D1 in MCL . Moreover P276-00 showed down regulation of an important regulator, pRbSer780 and total Cdk4 which initiates the G1-S transition of the cell cycle. Knockdown of Mcl-1 using siRNA in MCL cells lead to significant apoptosis indicating its importance in cell survival. Similar results have been observed by Chen et al previously . We have shown that in addition to cell cycle protein levels, P276-00 also inhibited transcription of key survival protein Mcl-1 which could be attributed to P276-00 effect on Cdk9 inhibition . Earlier reports indicated that MCL cells use multiple survival pathways to evade apoptosis, which possibly renders them resistant to a variety of therapeutic interventions and hence targeting cyclin D1 alone may not prove to be an effective strategy, especially for MCL blastic variant in which expression of Mcl-1 has been shown to be associated with aggressive phenotype [9, 19]. Rapid apoptosis in Jeko-1 cells could be attributed to transcription inhibition of short-lived protein Mcl-1. In addition to deregulated cell cycle control, it is clear that aberrant apoptotic and pro inflammatory pathways play an important role in pathogenesis of MCL . Therefore, it was interesting to understand combination effects of P276-00 with standard-of-care for MCL. Preliminary combination studies of P276-00 with proteasome inhibitor bortezomib and doxorubicin were found to be synergistic. Further potential combination approaches need to be addressed. Notably, triple combination of siRNA for cyclin D1 and Mcl-1, with P276-00 is significantly effective as compared to drug alone suggestive of the need for inhibition of multiple pathways for proficient therapy for MCL. Of importance, the in vivo efficacy in MCL xenograft in SCID mice model demonstrates that P276-00 significantly inhibited tumor growth and prolonged the survival of tumor bearing mice. PK-PD studies on the tumor samples clearly demonstrated down regulation of protein levels for cyclin D1, pRbSer780 along with antiapoptotic proteins viz. Mcl-1 Bcl-2 and Bcl-XL. This indicates that the significant antitumor effect is due to frank apoptosis and it was associated with peak P276-00 plasma and tumor concentration of 5–16 μmol/L in Jeko-1 and Mino tumor samples. Importantly, we observed two times higher parent compound in tumors as compared to plasma indicating that in vivo P276-00 is effective and therapeutic to MCL. In summary, we investigated the action of P276-00, a Cdk inhibitor in three MCL cell lines. Our results show that treatment of MCL cells with P276-00 down regulated important proteins which contribute to pathogenesis of MCL viz. cyclin D1 and Mcl-1 along with cell cycle regulators viz. pRbSer780, Cdk4, Cdk9. These remarkable in vitro and in vivo efficacies of P276-00, provides a framework for clinical application as a single agent or in combination with conventional therapies in MCL (Figure 7). Thus these data collectively suggest that by merely decreasing the proliferative and survival signatures of the disease we could possibly have a better overall prognosis of the disease. A phase II study is currently ongoing (http://www.seattlecca.org/clinical-trials/lymphoma-UW09052.cfm). 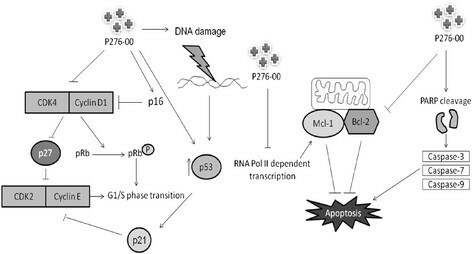 Schematic representation of effect of P276-00 on cell cycle regulator and apoptosis in MCL. P276-00, a Cdk4-D1, Cdk1-B and Cdk9-T1 specific inhibitor showed potent antiprolifeartive effect in MCL cell lines by targeting positive and negative regulators of cell cycle with modulation of apoptosis. Human MCL cell lines Jeko-1, Mino and Rec-1 were obtained from ATCC (Rockville, MD, USA). All three cell lines were cultured in RPMI-1640 medium containing 10% fetal bovine serum (FBS) (Hyclone, UT, USA), 2 mmol/L L-glutamine (Gibco, Grand Island, NY, USA), 100 U/mL penicillin and 100 mg/mL streptomycin (Gibco). Cells were maintained at 37°C in a humidified atmosphere containing 5% CO2. P276-00 was synthesized at Piramal Healthcare Limited, Mumbai, India, Roscovitine was purchased from Sigma (St Louis, MO, USA). Both drugs were dissolved in dimethyl sulfoxide (DMSO) at a concentration of 10 mmol/L and stored at -20°C until use; required dilutions were made in culture medium RPMI-1640 immediately before use. All reagents were purchased from Sigma (St. Louis, MO, USA) unless stated otherwise. Cytotoxicity of P276-00 on MCL cell lines was assessed using a CCK-8 assay according to the manufacturer’s instructions (Dojindo), as mention earlier . Each concentration was plated in triplicate. P276-00 was applied at five concentrations (0.01, 0.1, 0.3, 1, and 3 μmol/L) while roscovitine was at concentrations (1, 3, 10, 30 and 50 μmol/L). Cells were incubated for 48 and 96 h. At the end of incubation period, CCK-8 was added (10 μL per well) and absorbance was measured at 450 nm using a spectramax microplate reader (Molecular devices, CA, USA). Data was analyzed to determine the IC50 (concentration of compound that inhibited cell growth by 50%). The human MCL cell lines were seeded at 1.5 × 106 cells/mL in T-25 flasks and treated with or without IC50 or 3X IC50 of P276-00 for various time points. Lysates were prepared and western blotting was carried out as described previously . Following antibodies were used: RNA polymerase II CTD phosphoserine 2/5 and Mcl-1 (Cell signaling technology, USA), PARP and Bcl-XL (BD pharmingen, USA), β-actin (Sigma, MO, USA), Cdk4, pRbSer780, p21, p16, p27, p53, Bcl-2, cyclin D1, cyclin T1, anti-rabbit–HRP and anti-mouse-HRP secondary antibodies (Santa Cruz Biotechnology, CA, USA). Mino cells were seeded at a density of 1×106 cells per well of six well plate with treated cells exposed to 1.5 μmol/L P276-00 for 6 h. Cells were harvested and processed for immunofluorescence as described previously . The human MCL cell lines were seeded in T-25 tissue culture flasks at a density of 0.5 × 106/mL and treated with or without (control) IC50 and 3X IC50 concentrations of P276-00 for 24 h, 48 h and 96 h. Cells were harvested and processed for flow cytometry as described previously . Mcl-1 Forward: TAAGGACAAAACGGGACTGG; Reverse: ACATTCCTGATGCCACCTTC with annealing temperature of 55°C and cycle no. 32, Tubulin Forward: TCTGTTCGCTCAGGTCCTTTTGGCC; Reverse: CGTACCACATCCAGGACAGA with annealing temperature of 55°C and cycle no. 32. The PCR products were loaded onto 2% agarose gels and visualized with ethidium bromide under UV light. As a control for cDNA synthesis, reverse transcription-PCR was also performed using primers specific for tubulin gene. Jeko-1 cells were plated in six-well plates with 0.2 × 106 per well in FBS-free and antibiotic-free media. The cells were transfected with siRNA (cyclin D1-specific siRNA or Mcl-1 siRNA or non-specific siRNA, QIAGEN, USA) using Lipofectamine2000 Transfection Reagent (Invitrogen, Carlsbad, CA) as per manufacturer’s instructions. For cyclin D1 and/or Mcl-1 knockdown, the cells were treated with 100 nmol/L siRNA. After transfection, the next day P276-00 was added (1 μmol/L) and the cells were incubated further for another 24 h or 48 h.
Severe combined immunodeficient (SCID) mice were injected in 0.2 mL volume (0.1 mL of the cell suspension containing 1 × 107 cells and 0.1 mL of Matrigel) s.c. on the right flank. When the tumors attained a diameter of 100 mm3, mice were randomized into 2 groups i.e vehicle control (water) and P276-00 (50 mg/kg). Both the groups were dosed i.p. with vehicle control and P276-00, formulated in water, daily for 15 consecutive days. Animal survival was plotted using Kaplan Meier survival curve and was monitored for 5 weeks post treatment discontinuation. Tumors from animals were excised at the end of the treatment post 15 min of dosing. Further tumors were weighed and snap-frozen for protein expression analysis and pharmacokinetic studies. Protein extracts were prepared and subjected to western blot analysis as explained earlier, and probed with different antibodies. Densitometric analysis of western blots was carried out using Image J 1.42 q software. Animals were maintained and experiments were carried out as per the institutional animal ethical committee in compliance with the guidelines of the Committee for the Purpose of Control and Supervision on Experiments on Animals (CPCSEA), India. Statistical comparison was made using GraphPad PRISM® (versions 3.0 and 5.0, GraphPad Software, Inc., USA) software where one-way and two way analysis of variance (ANOVA) and Tukey’s multiple comparison post-tests were used to determine significant differences between several treatment groups. Student’s unpaired t-test was employed when only two groups were compared. Data are presented as mean ± S.E.M. of at least three independent experiments with triplicates. Statistical significance was evaluated by calculating p values, where p < 0.05 was considered statistically significant. (*p < 0.05; **p < 0.01, ***p < 0.001). Log-rank test was used for the animal survival study and Kaplan-Meier survival curves were generated from this test. The work has been supported and carried out at Piramal Healthcare Limited, Goregaon, Mumbai, India. We extend our thanks for the support. Also, we thank Dr. Anagha Damre (DMPK group, Department of Pharmacology) for analysis of the tumor samples and Maggie Rathos for the discussion and comments in combination studies. KJ conceptualized and guided the research project. NS performed experiments viz. cytotoxicity, flow cytometry, in vivo efficacy including PKPD studies and combination studies. SM performed and analyzed western blot, RT-PCR and siRNA experiments. Manuscript was written by NS and KJ. All authors approved the final manuscript.